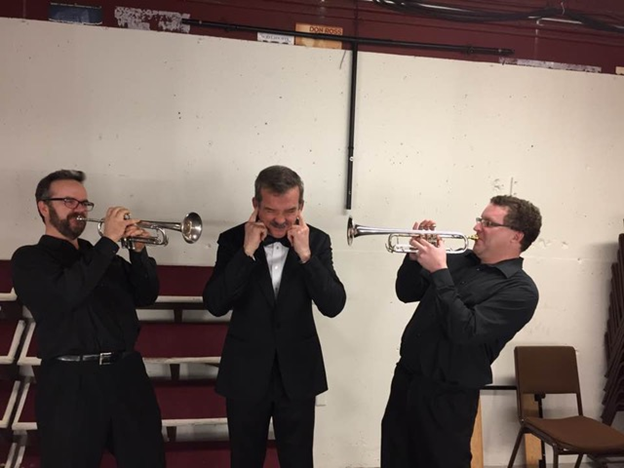 We asked orchestra Trumpet Curtis Dietz to share his thoughts on meeting and playing music with Commander Chris Hadfield. I was very fortunate as a member of Symphony Nova Scotia to spend the weekend with the great Canadian Astronaut Chris Hadfield. After watching him answer questions from the audience over three days and spending time with him backstage, I thought I would share some of my observations of what I believe makes Cmdr. Hadfield so extraordinary and what we can all learn from him. Curtis Dietz (left) with Cmdr. Hadfield and Richard Simoneau. 1) Find your passion early. 2) Expect adversity and lots of it. This was a big one with Cmdr. Hadfield. He loved to recount all the adversity that every pioneer or explorer has encountered over the centuries. Money problems, disastrous expeditions, disease, you name it. It is very empowering when striving for high goals to expect plenty of adversity. Why not be pleasantly surprised if it turns out to be easier than planned? I found it jolting as I realized our society seems to have become incredibly risk averse and defeated with even minor obstacles. Expecting plenty of extreme challenges to our goals arms us to overcome them when they inevitably happen. Talking to him really convinced me that humans can accomplish incredible things if we are determined enough. He seemed absolutely convinced of that. Some questions were raised about the political situation at the moment. Cmdr. Hadfield very interestingly never mentioned “you know who” in any answer (at least that I recall). He simply would turn the question around and state that there are thousands of amazing things being done all over the world right now and spouted off name after name of scientists, engineers, researchers of people we SHOULD know and don’t. I realized that to keep talking and complaining about “you know who”, and being glued to the usual news cycle, is draining our attention and focus on what is important. Check out Chris Hadfield’s Facebook and Twitter feeds! He has his eye on the future and where we are in the BIG picture. Cmdr. 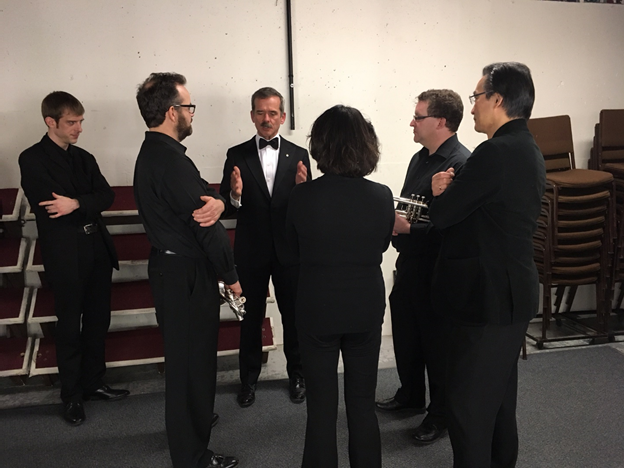 Hadfield chatting with our musicians backstage. 4) Music might actually be important. The place of music in Cmdr. Hadfield’s life was obviously huge and continues to be after his amazing astronaut career. It helped form his mind, helped him communicate his experiences in space like no one else, and will no doubt be his companion for the rest of his life. He used music to personalize his journey in a way only songs, stories, and other arts can. There have been countless shipwrecks, but why do we remember the Edmund Fitzgerald? Gordon Lightfoot immortalized it with his unforgettable, haunting song. I think Cmdr. Hadfield realizes that his task is to transfer his amazing experiences to us in the same way with his music. To keep people connected and invested in the future of space exploration, the value of this is now realized thanks to Cmdr. Hadfield. Perhaps the aspiring astronauts of the future should be practicing their scales! For all his accomplishments, Cmdr. Hadfield is still incredibly curious about the universe. He is genuinely excited with new developments in science and space exploration (and almost every other field of study)! As he meets his legions of fans, he is obviously curious about them and where they may hail from to see if he might have a connection. His dressing room door was always open and he had time for absolutely everyone. Amazing. Cmdr. Hadfield has tasks reduced to a one page list. It even had “button jacket” on there. I would have loved to talk to him more about how he processed a lot of information and problem-solved. He said before he would throw a switch, he would think backwards to where it was going and all that it would affect. Fascinating stuff. I’m not sure what it is, but there is something almost Samson-like about his moustache. See if you can even imagine him without it; I couldn’t! All in all, it was a truly inspiring weekend. Thank you so much Cmdr. Hadfield and Symphony Nova Scotia for making it happen.